Montell hitting it at Austin UFC Gym. I was born October 23, 1980 in Dallas Texas where I was raised by my mother in a broken home. I enlisted in the Marines September 13, 1999 where I deployed three times in support of Afghanistan, the U.S.S. Cole and Iraqi Freedom. I served all four years without report and made it into the Non Commissioned ranks. I was honorably discharged in 2003 and had seven jobs within the first year. I had a hard time connecting with people my own age; they did not understand me. I have been to seventeen different countries and have made decisions they could not fathom. I battled with alcohol and anger and depression. After five years of trying to put on a fake face to try and fit into the world, I had had enough and joined the Navy December 16, 2008. The navy was a challenge for me, not many understand a combat Marine, nor can they relate to ground actions, but they can tell you about long and exhausting deployments and what it means to serve and support. I made it through the ranks fairly quickly, earning Second Class Petty Officer in two years along with my Enlisted Aviation Warfare/Enlisted Surface Warfare device. I also deployed three times in the Navy and was actually in the Persian Gulf taking on the last ground troops as a sailor, when ten years earlier I was there as a Marine. I had been putting on a front for ten years and had reached my point and sought mental counseling while on active duty in the Navy. I was immediately placed in a medical hold status and began a long and painful journey out of the military ending with a Medical Retirement. After joining the military twice and serving with honor and no question, I am told I can no longer serve! In 2013 I was beginning to develop cirrhosis of the liver from the cocktail of drugs the military had me on. I was living in California and began to do research into medical Cannabis and discarded all of the V.A. prescribed drugs for a much safer and healthier alternative. My family and I found ourselves in a dark place, my depression was weighing the family down. We were transitioning back to Texas and I was lost and without hope. I was placed under emergency detention for five days in the Texas V.A. hospital for a suicide attempt. After I was released, I knew something had to change, I could not spend the rest of my life in and out of the mental ward. 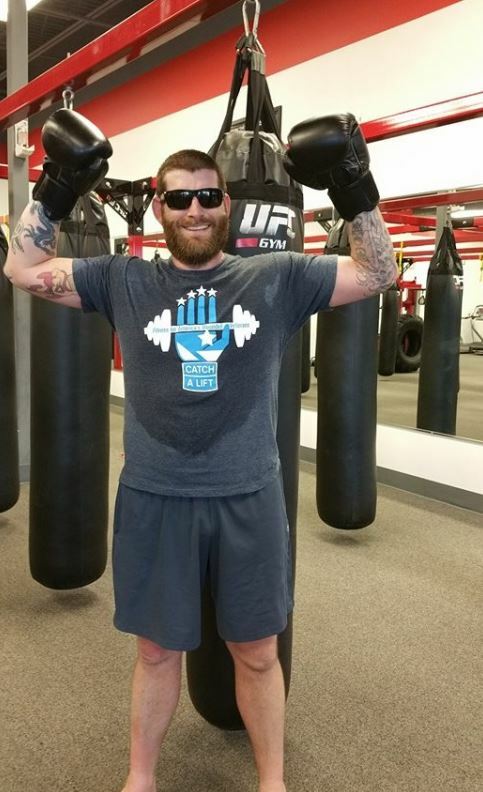 I was introduced to Catch A Lift and told they could help get me a gym membership and reconnected with other vets. I weighed 302 and wore a size 42, I was struggling with going to counseling and starting to just blend in with the background, I slowly started going to the gym and then on into counseling. A year later I am 197 pounds and wear a size 32, I am healthier and more focused than I have been in years. I don’t think this is a story of how I got here, we all have something to battle, the story is recovery. We have a generation of veterans that are left with anger towards our government, what we need instead is a generation of empowered men and women with years of leadership and discipline to stand up and lead, to say we have seen the price of freedom on the battlefield now we will stand and show you what it means to be a free American citizen. Having been in the CAL program for three years now my focus has been toward service to other veterans, taking on a leadership role, mentoring and modeling positivism for a better change. Having dealt with my own issues for thirteen years and between two services, I have found ways to better understand my true battles and how to process them positively, and to pass along this to my fellow veterans.